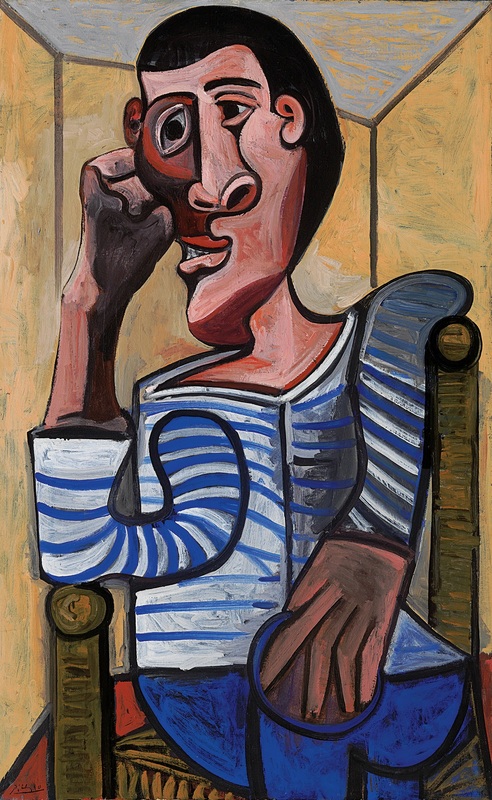 Christie’s has another big ticket Picasso for the May sales. With the Rockefeller’s rose-period portrait of a young girl looking to make an easy nine figures, the auction house turns to a self portrait of the artist painted during World War 2. Estimated at $70m, Christie’s is making much of the fact that the painting was owned by Victor and Sally Ganz whose collection remains one of the benchmarks of the 20th Century. Victor Ganz was passionate about Picasso. He owned numerous works by the painter and only stopped buying when they became too expensive. Ganz bought the whole Femmes d’Algiers series of 15 works and sold off half of them to own the ones he really wanted. Christie’s points to Version O from that series which became the most expensive Picasso three years ago when the auction house sold it for $179m. Le Marin last appeared at auction in 1997, as part of the legendary sale of the Collection of Victor and Sally Ganz. Over their lifetime together, Victor and Sally Ganz assembled what is still one of the most celebrated collections of the 20th Century. Prominently hung in their Manhattan living room, Le Marin was purchased by Victor Ganz for $11,000 in 1952 from the publisher Harry Abrams. It was Picasso’s only male image in the Ganz Collection. I asked why he painted himself as a sailor. “Because,” he answered, “I always wear a sailor shirt. See?” He opened up his shirt and pulled his underwear–it was white with blue stripes! Created only weeks after the most dangerous crisis Picasso faced in World War II, Le Marin reflects the artist’s emotional and psychological distress. In 1944 Picasso said, “I have no doubt that the war is in the paintings I have done.” Perhaps no painting which he made during the Occupation more directly conveys this feeling than Le Marin. At the outbreak of the war Picasso elected to stay in France, despite offers to move to Mexico and the United States, expressing at the time that “Most certainly, it is not a time for a creative man to fail, to shrink or to stop working”. Although Picasso was a Spanish citizen, the decision to stay in France required a great deal of courage. As the painter of Guernica, he was an internationally recognized anti-fascist. In a speech, Hitler had denounced him by name. German agents regularly visited his studio in search of incriminating evidence, during which they insulted him and destroyed his paintings. It was previously thought that these threats never rose above the level of harassment. However, a letter found in the Archive Picasso, dated September 16, 1943 – just five weeks before he painted Le Marin – demonstrated that the Nazis planned to deport Picasso to a concentration camp. Picasso was saved only by the intervention of friends, Dubois and Cocteau, and especially by Arno Breker, Hitler’s favorite sculptor, who spoke to Hitler on the artist’s behalf. Other people in Picasso’s circle were not so lucky. Max Jacob, who had been one of Picasso’s closest friends, was deported to a concentration camp in the spring of 1944 and died there. That August, the Allies would liberate Paris. Estimated in the region of $70 million, this masterpiece of the Second World War is set to realize one of the five highest prices for the artist at auction.